Hacking the APEX error page – Part 2! Do you want to have highlighting for the tabular form column cells which have an error? Then you should read the rest of the posting! I have enhanced the original Hacking the APEX error page code (the original posting has been updated) and created a new package ApexLib_Error which can be used to “raise” errors in a process or validation process when you process your tabular form values. 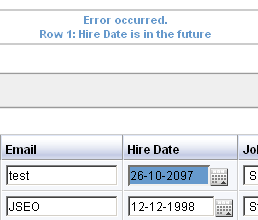 The advantage of this package is that it allows you to provide the column and row number when you raise an error. When the error message is displayed above the tabular form region, all the column cells which are related to an error are highlighted. Check out the updated Enhanced Tabular Form with column cell highlighting example. This new package enhances the existing Plug & play tabular form handling solution. You have different possibilities to use the new package. It has methods which can be used in validation process of type Function Returning Error Text and PL/SQL error. If you use it in a process you always have to use the raise* interface. It puts to errors onto an error stack, the first call identifies the column by the name (works only for updateable tabular forms) and the error text is hard coded, but with placeholders. The second call uses a defined text message (Shared Components/Text Message) and identifies the column with the fxx syntax (in the case if you know to which HTML form item the column is mapped to). At the end of the validation process the error stack is returned to APEX. If no error is on the stack, nothing is returned. So this statement should always be the last statement in your validation process! Same as the above example, the difference is at the end of the code. Instead of returning the error stack we raise it with an RAISE_APPLICATION_ERROR so that APEX can capture it. This method of adding errors to the stack, allows you that you can also have multiple errors. This will immediately abort processing and the error is returned to APEX. For a real world example check out the Plug & play tabular form handling posting. The code has been tested with Firefox 2.0 and IE 7.0. Where do I get the source code? I have started a new SourceForge project, get the source code there. Have questions? Don’t hesitate to write me a note! Fixed an issue with Internet Explorer. This entry was posted in ApexLib and tagged error, tabular form by Patrick Wolf. Bookmark the permalink. I just wanted to say that I read the Apex Forum and blogs of people like Carl, Dmitri, Benjamin Wootton, John Scott and find them useful. I found the link to yours a short while ago, and congratulate you on your excellent posts. There are some really great bits of advice in here. Please keep up the good work. good to hear that you like my blog! That really motivates me to continue blogging. Sure I see the visitor stats for my blog, but you never know if people find it useful what I’m writing. I would like to echo Jon’s comments about the excellent code/techniques you have implemented. Every day APEX looks more and more like a “full strength” web development platform. you are right with that check, never thought that a user modifies the data and then deletes the row 🙂 I have created a bug for that, so that it is ignored in the future. When I delete now a row, the columns are not checked anymore. Can you try that again? thanks for confirmation. I tried it again, it works! It seems I had had a mistake somewhere when posted you my initial question. I would like to ask you two things also. In this case we don’t actually know which column has an error value (or simply a user misprint). It would be nice to have a method to associate such ‘logical errors’ with several fields if it’s possible with ApexLib. I have created a feature request for this topic and will think about how to solve that. Thanks for your stuff on hacking the error page – very useful. I have implemented your solution and when I try to save the required field is coloured blue and the error message displayed at the top of the screen. However when I then type something into the field and press submit all that happens is that the field turns white and I have to press submit again to save. This happens in your example also. Do you know any way that I can get it to submit the page and save the data the first time I hit submit after the error is displayed? I think the reason is that the browser “forgets” the button click. When the button is clicked the focus is moved to the button and the onchange event for the item is triggered, which will remove the error text. Anybody out there having an idea what to do!?!? As written in the Forum Thread the problem was solved, ApexLib Files have been copied to a wrong directory on the server.